Bestellen Sie innerhalb von 10 Stunden, 26 Minuten und 17 Sekunden dieses und andere Produkte. Create optimal storage space in your garage, workshop or cellar. Thanks to our boltless shelf, this is easy as pie and does not take much time, without any tools or screws. 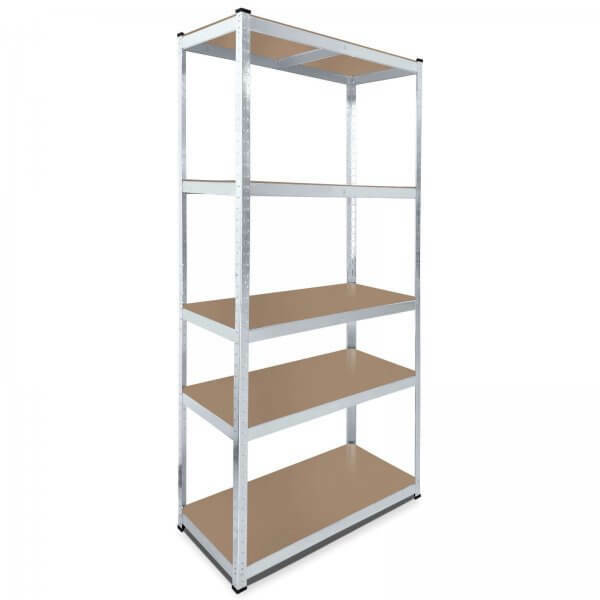 Since the shelf rack is made of galvanized metal, the value of our shelf is undoubtedly given. The shelves made of MDF wood are particularly break proof and resilient, making them ideal for heavier loads. For more stability, the delivered crosspieces prevent sagging of the shelves. Furthermore, the shelf can be fixed to the wall. When determining the height of the shelves you are completely free. Additional flexibility offers the combinability of this shelf with other shelves from our range. In addition to storage space, you can also create optimal work surfaces with our shelf, by simply turning it into a workbench. All in all, our versatile boltless shelf enables flexible room or storage design. Weiterführende Links zu "Lagerregal 205 x 100 x 50 cm Steckregal Traglast 875 kg verzinkt"
Kundenbewertungen für "Lagerregal 205 x 100 x 50 cm Steckregal Traglast 875 kg verzinkt"